We are pleased to offer KIBO to customers both domestically and internationally. Choose from individual KIBO robot kits, or combine them to make your own classroom packages. Student workbooks, curriculum, assessments and KIBO training and other teacher materials are also available. 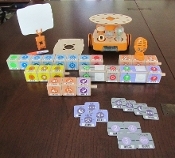 Please see a printable price list on KIBO Robot Kits, Classroom packages and training. If you already have KIBO and need other items, you can find modules, sensors, extension sets, programming blocks, and parameters here too. Thank you for your interest in KIBO! If you have any questions, please contact us at [email protected]. For United States orders, if you would like to submit a PO vs. ordering in the online store, we would love to help! Please see the PO requirements. Email the PO to [email protected] or fax them to 781-894-4033. As always, we are just a phone call away at 781-894-4022, if we can help in any way.